Global trade in goods and services was severely hit by the economic crisis in 2008, which initiated a pronounced but short-lived trade collapse. Until 2011 trade flows recovered relatively quickly, but since then global trade in goods has been rather anaemic. This development is partly the result of the low dynamics of EU-related trade which accounts for a large share of global trade flows. Regarding intra-EU trade a strong increase in overall bilateral trade intensities is observed. The process of EU integration before the crisis and differentiated growth patterns of goods and services exports implied that exporting activities became slightly less concentrated across EU Member States. However, specialisation dynamics implied an increasing geographic clustering and specialisation of goods and services exports across Europe. 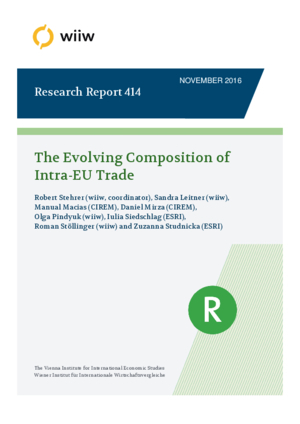 These changes in the geographical patterns of intra-EU trade activities were mostly driven by changes in the patterns of trade in the medium-quality segment which can be interpreted as a ‘climbing up’ phenomenon of less advanced countries. Results from a gravity framework suggest a structural break of these trends after the crisis. Another aspect of the increasing trade intensity is the role and magnitudes of intra-firm trade and potential determinants thereof. However, research on this is hampered by a severe lack of data and only a few insights can be gained, mostly for extra-EU trade. Results based on foreign affiliates’ trade statistics (FATS) data indicate that intra-firm trade flows were responsible for more than half of total trade between the EU and the US in 2012. Results also suggest that intra-firm trade has been more resilient to the trade crisis despite the more difficult global environment for foreign direct investment and export activities. Based on a gravity approach, overall EU intra-firm trade is estimated to be lower, though these results need to be interpreted with caution. In a case study based on Irish firm-level data it is shown that intra-firm trade accounts for 30% of exports and 25% of imports.